This article provides some curative Homeopathic medicines for coughs. In my previous post calledHomeopathic Cough Cures part 1, I explained when it is important for your health to leave a cough to do its work rather than suppress it. I also outlined when we should definitely treat a cough and taught you how to take an effective homeopathic cough case. In this article you will be able to select your Homeopathic cough medicine from the medicines explained below. I will cover Croup specifically in another post in this series. Aconite: This cough is a dry, often barking cough with a sudden onset, that may arise after exposure to cold (especially cold wind) ,or after a sudden shock or fright. If fever is present the head will be hot but the extremities cold or cool to touch. Patient may be restless and/or fearful. Bryonia: The patient with this cough will have a dry, painful chest and may place their hands on either their chest or head when they cough. They may be extremely irritable and worse in a warm room. Rumex: This irritative cough has a dry tickle in the throat. Breathing in cold air can set this cough off and they are usually worse at night. 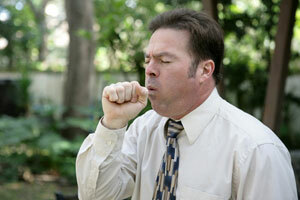 In fact any temperature change can cause them to cough so watch if moving from house to car makes them worse. Spongia: A dry hacking cough with a sound as if drawing a saw through wood. The cough is both day and night usually and if the patient bends their head backwards it makes it worse. They are worse from breathing in, cold drinks and better for bending forwards. Antimonium Tartaricum: (Ant Tart) use this medicine if the patient has a loose rattly chest but does not bring up anything when he/she coughs. This medicine will change the cough to a productive loose cough which should enable the patient to clear their chest effectively. Often indicated in young children and infants. The cough is rattling, wheezy, choking. Hepar Sulph: This is for a loose croupy cough with thick, yellow mucous. The cough sounds both loose and ‘thick’ and can sometimes be dry and barking. Can feel as if needles or splinters are in the throat. Ipecac: Often a dry tickling cough or a loose, rattly cough often in infants such as in bronchiolitis. Spasms of coughing may be followed by vomiting. In children they may feel as if they will vomit with each coughing fit. Pulsatilla: A cough from allergy , asthma or a head cold. Loose, rattling with green or yellow expectoration. Can be dry in the evening then loose in the morning. Worse in the evening, or in bed at night or after becoming cold and or wet. If it is a cough caused by allergy the patient will be worse in a warm room. This is a good medicine for post nasal drip. Use pillows to prop up patient at night and a gentle, cool fan may help. Kali Carb: An excellent medicine for a loose productive cough with bronchitis or conversely a dry, tickling cough. The cough is worse in the night partucularly between 2-4am. The cough may cause the patient to vomit and they may also have stitching pains in the chest on coughing. If you are unsure about how to decide which are the important symptoms in a patient with a cough please refer to Homeopathic Cough Cures Part 1 . Prescribing for chronic coughs is more complex so if you need help with this and a professional consultation for your chronic cough, find yourself a local Homeopath or book a skype online consultation with me and let’s get to work! Hello! I’m so very happy to find this link. Wonderful to have people that practice homeopathy. I myself have used it since I was 13, so about 17 years. I’ve studied under Jackie Featherly, an amazing teacher!!! Thank you for sharing all your info. Our homeopathic practitioner would take a homeopathic bottle and hold it to the forehead for about 1 min and then to the chest for about 1 min and the results were astonishing – the congestion my son had experienced for about 3 years had stopped altogether. Of course it came back 5 minutes later – but just the fact that it stopped the flow of mucus. Eventually we chose to have our son take the homeopathic and it worked – congestion was gone for good. Give it a try if you’re trying to decide if one of a number of homeopathics are possibilities. I have been using the natural medicine Acidim. It is an excellent product to reduce symptoms of a dry and persistent cough. It comforts my indigestion which causes dry cough and helps in normalising my discomfort. Please guide me on miasms. what would you like to know about miasms?